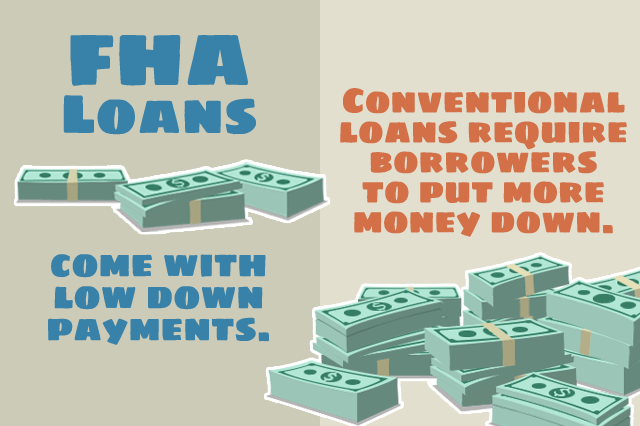 If you are wondering about FHA loan down payments and the rules that govern their sources, you aren’t alone. Down payment rules can seem a bit confusing on the surface, but if you remember a few basic FHA loan rules, this is an area you can understand quickly. March 12, 2018 - If you are wondering about FHA loan down payments and the rules that govern their sources, you aren’t alone. Down payment rules can seem a bit confusing on the surface, but if you remember a few basic FHA loan rules, this is an area you can understand quickly. FICO scores 580 or higher are eligible for maximum financing w/a minimum down payment of 3.5%. FICO scores between 500 and 579 are technically eligible for an FHA home loan with a 10% minimum required down payment. Applicants with FICO scores below 500 are not eligible for an FHA home loan. 580 is the FHA minimum and not the lender’s minimum FICO score for these down payment guidelines; your participating FHA lender may have a higher requirement depending on the financial institution. FHA down payments are calculated based on the adjusted value of the property. The adjusted value is made available after an FHA appraisal has determined that value, so you won’t get a specific, exact dollar amount until after the appraisal. FHA home loan down payment calculations are not made with add-ons to the loan such as the financing of Up Front Mortgage Insurance Premiums. The down payment is calculated strictly on the minimum percentage required of the adjusted value of the property. The other items added into your final loan amount are added after the amount of your down payment has been determined (again, based strictly on the adjusted value of the home). HUD 4000.1 includes rules that strictly regulate down payment funds. Your participating FHA lender is required to verify the source of all down payment funds whether they are provided in cash by the borrower, are the result of cashed-in investments, gift funds, or by other FHA approved means. Participating lenders cannot accept down payment funds from unapproved sources such as a payday loan, credit card cash advance, “pink slip” type loans, etc. The lender is required to make sure the borrower has not gone further into certain kinds of debt in order to make the down payment. Additionally, while FHA loan rules permit interested parties to contribute up to six percent of the sale price of the property in order to cover approved closing costs, up front mortgage insurance premiums, or other expenses. But these contributions can never be used as part of the down payment-it is expressly prohibited in HUD 4000.1.